Rye first appeared rather late in the history of human civilization. The oldest archaeological records of rye date from the Hallstatt period in Silesia, Thuringia and Westfalia and from the Lacène period. After the pioneering work of N. I. Vavilov on the origin of cultivated plants three broad classes came in recognition: wild, weedy and cultivated rye. As a crop, rye is most winterhardy of all cereals so that in Northern Europe its cultivation reaches beyond the Arctic circle in Finland. While Soviet Russia contributes most to the total world production, in Finland, Poland, Germany, Sweden, Netherlands and Belgium also its rank is high among grain crops. It is striking to note that for the past many years, research on practical agronomical and breeding problems has been quite active in these countries and currently attempts to improve rye are being made on modern lines. Some of the main problems in this field concern with the development of hybrid varieties, improvement of autotetraploid fertility, use of best pollination procedures to obtain highly self-fertile lines and the transfer of rye characters to wheat as such or in the form of amphiploid Triticales. In Russia, however, the Michurinist agrobiologists are primarily engaged in the study of interspecific conversions, branched ear types and nutritional methods of improving varieties, and perhaps this is one reason of only little having been known about rye genetics. 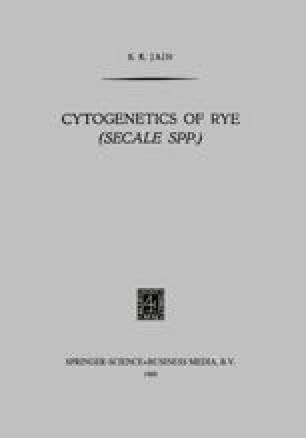 As a material for cytological research, however, rye has been generally favoured and indeed such of its features as possibility of studying pachytene chromosomes, success of autotetraploidy and the occurrence of B-chromosomes are now well known.